Uneven charging of burden in circumferential direction has a negative impact to stable operation of ironmaking blast furnaces. 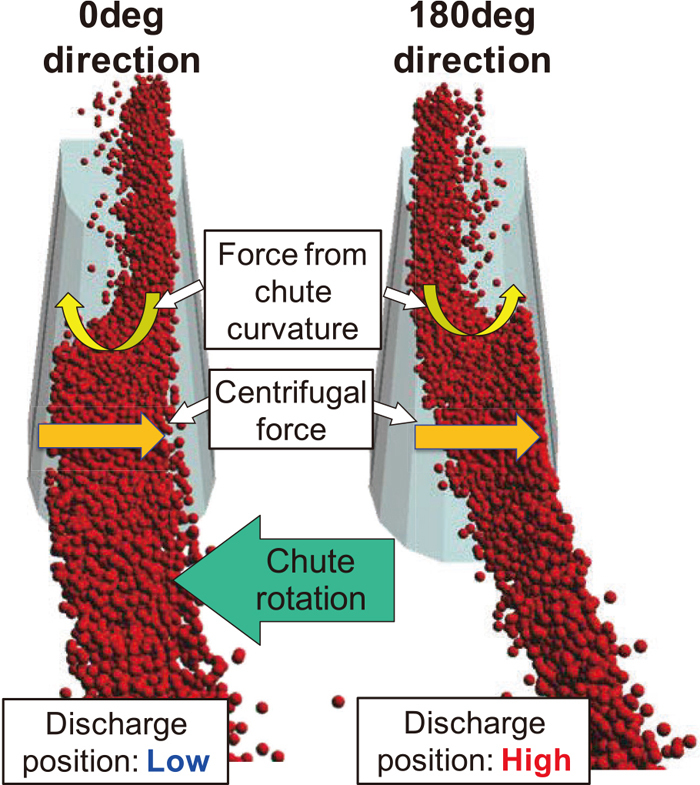 To visualize and prevent uneven charging, particle flow in bell-less top with parallel hoppers was simulated with different tilting angles of rotating chute by Discrete Element Method (DEM). The simulation revealed that the particles flowed decentering in the vertical chute, which led to circumferential imbalance in the trajectory from the rotating chute. The tendency of imbalance against the circumferential direction also differed by the chute titling angle. This tendency was also confirmed in the scaled down experimental work. As a counter measure, DEM simulations showed that after tapered vertical chute installed was improved the circumferential imbalance significantly.